With rain forecast to start at dawn it was a very long & busy night. We got some of that rain. And lots and lots of wind. I hope you got all you needed to do done in time. Love that sky. Just in time! 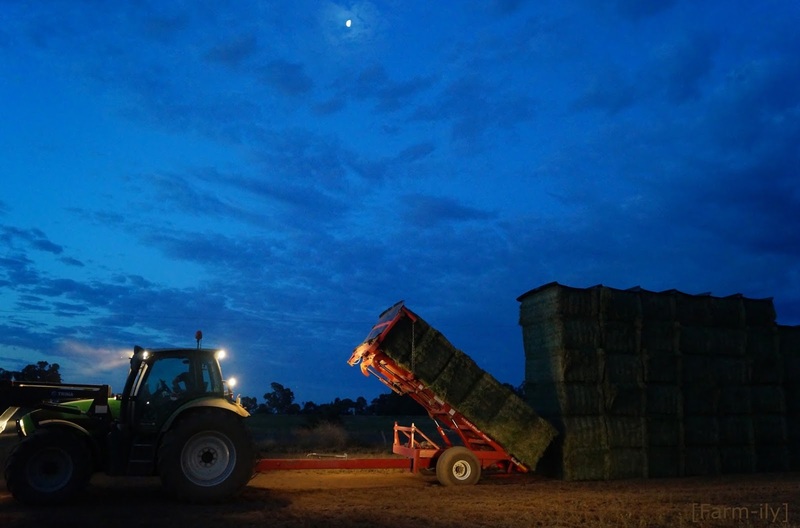 We were just carting in the last load of hay at 3.30am when it hit. That was pretty good timing, considering how much hay we had to make. This is us putting the hay under cover. Each of the top bales of hay has a Hay Cap in place so no rain gets into all the hay. A pretty quick way of getting hay under cover when rain is imminent. Your night shots are always so beautiful... as this one is! In true farmer form, shouldn't it be, we welcome the rain but it is falling at the wrong time. It's all about being prepared for it when it does fall... to the best of our ability anyway. Work is never done, but must be before it rains. Rained today, all day, just wonderful, we haven't had any till today...no wind either. We got 19mm in a couple of storms, which made the long night of work very worth while. I admire you for the hard work in your agricultural 24 hrs economy. You have the most beautiful skies! And you seem to know how to capture them so well. Wonderful capture....I hope you got done before the rain hit!